Combined Graduate Level Examination conducted by Staff Selection Commission (SSC) gets conducted in four tiers - Tier I, II, III and IV. SSC CGL Tier-I exam concluded on 23 August 2017. SSC CGL Tier-II exam will be conducted from 21st – 24th December 2017. 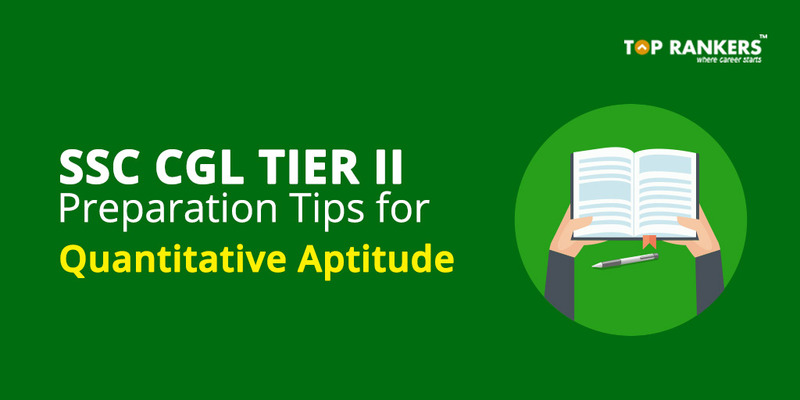 Before discussing the preparation tips to crack the SSC CGL Tier II Quantitative Aptitude section, let us have a look at the SSC CGL Tier II Exam Pattern. Coupon Code: You May use Coupon Code "QMATHS" to Avail 10 % Instant Discount. · SSC CGL Tier II Exam is an objective exam consisting of 4 sections- Quantitative Aptitude, English Language and Comprehension, Statistics and AAO General Studies (Finance & Economics). · There is negative marking system of 0.25 for every wrong answer in paper II (English Language & Comprehension) and 0.50 for each wrong answer in Paper-I, Paper III and Paper IV of Tier II exam. Mensuration: Triangle, Parallelogram, Rectangle, Pathway in a Rectangle, square Rhombus, Trapezium, Circle, Cube, Cylinder, Cone, Sphere, Hemisphere, Frustum, Right Prism, Pyramid and Tetrahedron. Algebra: Graphs of Linear Equations and Algebra and Elementary Surds. Trigonometry: Trigonometry Ratio Identities, Trigonometric ratio of multiple angles and Compound angle, Sign of Trigonometric ratio, Range of Trigonometric Ratio, Value of different trigonometric series, Height and Distance. Geometry: Basics of Geometry, Quadrilaterals, Triangle, Regular Polygon Triangle, Polygons, Circle etc. Ø Firstly, the most important thing that you need to keep in mind before starting the preparation is to be fully aware of the exam syllabus and pattern. Based on the syllabus, you can focus on the important topics and prepare accordingly. Do note, Algebra, Trigonometry and Geometry carry around 50% weight age. Ø Once the candidate is aware of the syllabus, next task is to make a study plan based on your weak and strong areas. Ø Time Management is the key to success in SSC CGL Tier II Exam. Candidates should learn to manage their time keeping in mind the negative marking. Candidates should set a time for solving the paper and check how much time is taken to solve the paper. Ø Practice calculations by making use of short tricks and formulas to enhance your speed, problem solving skills and to reduce your calculations in this section. Ø Revision is very important to retain information which is already learnt and to master the concepts. Make a habit to prepare short notes such as important formulas and tricks during preparation. It will help you in the last minute revision. Ø Practice taking SSC CGL Mock Test regularly to check the level of preparation for each section. Analyzing mocks is equally important so that you can measure your progress, understand your weak areas and then you can improve accordingly.Attempt both sectional and full length mock tests of different difficulty levels. Ø Candidates should solve SSC CGL Tier II Previous Year Question Papers to get the actual feel of the exam. Solving previous year question papers will also give you a brief idea of the difficulty levels of questions and also the exam pattern. Ø Candidates should also join online SSC CGL Test Series for unlimited practice options which will in turn help to enhance speed and accuracy. Hope the tips and strategies provided above will help you score well in the quantitative aptitude section of the SSC CGL Tier 2 exam. Disclaimer: This is an Sponsored post and may not represent QMATHS personal views.